As automation makes more jobs obsolete, what will humanity do with all the newly created spare brain power? As automation alters the way America does business, alarm about the future of employment is growing. One recent report claimed 1.4 million U.S. jobs would be disrupted or disappear by 2026. Another study predicted 375 million workers across the world would see robots occupy their jobs by 2030. And those numbers pale in comparison to our findings, which show U.S. workers currently spend over 48 billion hours a year in jobs that will probably be performed by robots soon. Contained in that staggering statistic are untold effort and grit expended by the American workforce – potential that could conceivably be applied to any pursuit or problem. It’s not surprising then some see the mechanization of menial labor in hopeful terms. As venture capitalist Marc Andreessen has noted, new technologies bring opportunity as related fields emerge – and humanity’s capacity to adapt is unmatched. Others say automation will shift the workforce from physical labor to higher callings, requiring creativity and empathy. This increasingly available spare brainpower has been called cognitive surplus, and it represents a huge potential future resource – which could be used for the good of the world. Some even imagine a world entirely without work, where we derive purpose from our passions, not our professions. However automation transforms our nation, machines will soon relieve millions of workers of their professional duties. The issue isn’t how to avoid that fate – the robots are coming – but how well-prepared we are for a future where millions of man hours are suddenly freed up. Analyzing BLS data, we studied the number of hours Americans spend annually working jobs that are virtually certain to be disrupted by automation. While the implications of automation extend to nearly every industry, we limited our approach to professions with an estimated likelihood of automation of 95 percent or higher. The country’s 3.5 million cashiers, for instance, account for more than 7 billion working hours annually. Their replacement is already a reality for Amazon, although research has repeatedly shown human interaction can actually increase customer spending. Office clerks represent a similarly large contingent, and their obsolescence would free up more than 5.8 billion hours of labor each year. In fact, many office positions account for billions of labor hours that will likely become unnecessary. Administrative assistants, bookkeeping clerks, and receptionists all put in more than a billion working hours annually, and each of these professions faces almost certain automation in the coming years. Other professions have already contracted due to automation and outsourcing in recent decades, meaning their eventual elimination would not free up significant human capital. Roles in the troubled textile industry, such as cutting or dying machine operations, each accounted for fewer than 30 million labor hours annually. For many who work in such manufacturing fields, the specter of joblessness is more a present threat than a concern for the future. But what could be accomplished if this impending abundance of time could be converted to productivity? Before we accept a future of uselessness, consider the triumphs achieved with far less exertion over the course of daily life and human history. Compared to the man hours automation will unlock, the time required for an array of human pursuits seems strikingly small. In the realm of leisure, reading a single book requires just 8 hours – and bingeing all seasons of a beloved show like “The Office” would take just 100. If these juxtapositions seem petty, consider more substantive goals. Building a single-family home takes just 1,337 man hours – if even a small portion of automated hours were applied to constructing houses,one could easily be built for every homeless American. What about objectives that serve to educate the public, such as authoring all Wikipedia articles in every language? Doing so would take only a tiny fraction of the time spent in jobs soon to be automated. Artistic accomplishments could prove equally attainable: “Avatar,” which consumed 10,964,160 man hours over 10 total years of production time with its meticulous special effects, starts to look like an easy undertaking in light of these available hours. Technological breakthroughs seem surprisingly feasible on this scale as well. All the hours required to found and operate Facebook, complete the Apollo moon missions, and build the Panama Canal would not amount to one-tenth of the time Americans spend each year working in jobs machines will soon occupy. The sheer human potential that automation could unleash is difficult to conceptualize. To help compare the working hours of automation-prone professions with the time required for various human accomplishments, we created the volume visualization below. If you still doubt the gargantuan potential for workers, this graphic should leave no doubt. In this light, the possibilities for the productive use of outmoded workers’ time may seem endless. But to accomplish anything with the time they once spent at work, Americans soon to be affected by automation must acknowledge and prepare for a vastly different future. Is this change in perspective taking place, or does denial still dominate? To find out, we asked American workers in vulnerable industries. We surveyed 1,001 workers to find out how those with professions likely to be automated felt about their odds of keeping their jobs. When asked whether they thought machines would eventually assume their roles, most expressed skepticism. On average, workers rated the chances of keeping their job at 54% percent. Unfortunately, our data suggest a more accurate average likelihood is only 3.1%. In other words, people are over 17 times more likely to lose their job to automation than they realize. This disconnect echoes findings of other studies: Only 30 percent of workers think they’ll lose employment or income due to automation. But to see the threat underestimated so severely by the workers it’s most likely to affect is troubling. If they fail to recognize the coming change, will they be unable to apply their collective potential elsewhere? Our survey findings were in agreement with expert projections in another area, however: Education mitigates automation risk. Of all educational attainment, workers with technical or vocational training and those with only a high school diploma were attributed the highest average likelihood of having their duties automated. Unfortunately, those with just a high school degree were likely justified in their concerns, and some professions requiring vocational training – such as trucking – are more likely to be automated than others. 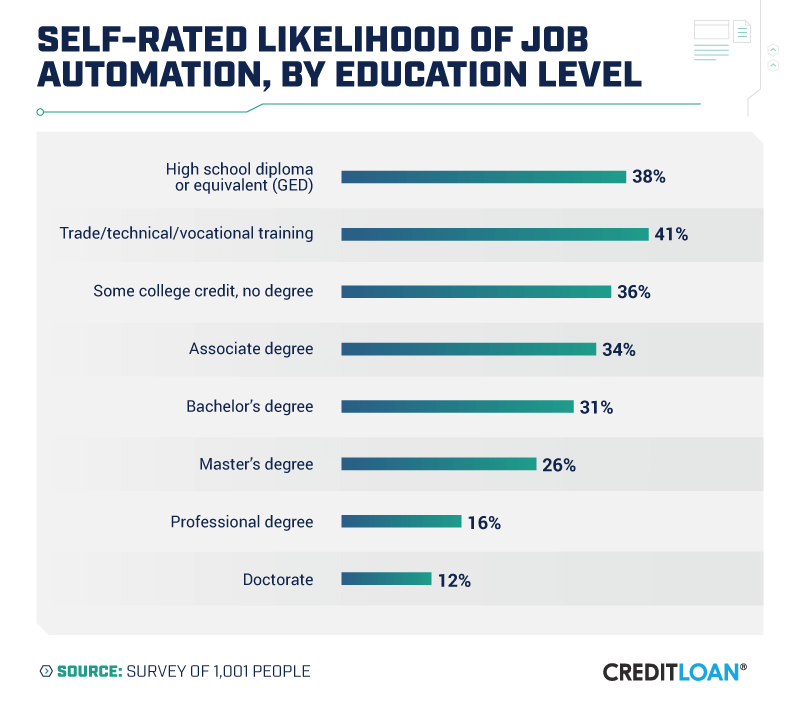 Confidence about avoiding automation increased with educational attainment. Bachelor’s degree holders said they were less likely to see their jobs mechanized that those with an associate, and concern was even lower among those with a master’s, professional, or doctoral degree. Their confidence is understandable; few highly paid or well-educated workers have lost their jobs to machines – yet. At all educational levels, however, workers significantly underestimated the likelihood their roles would be automated. This disparity between their fears and grim reality is perhaps understandable: No one likes to feel their job is in jeopardy. But when we size up other professions, are there some positions where automation seems not only inevitable but also truly appropriate? Among our respondents, nearly a quarter refused to endorse automation in any industry. Interestingly, however, many of the roles our participants most wanted to be automated represent significant portions of the workforce. Thirty-two percent said they would support robotic telemarketing, although more than 215,000 Americans are employed in that position currently. 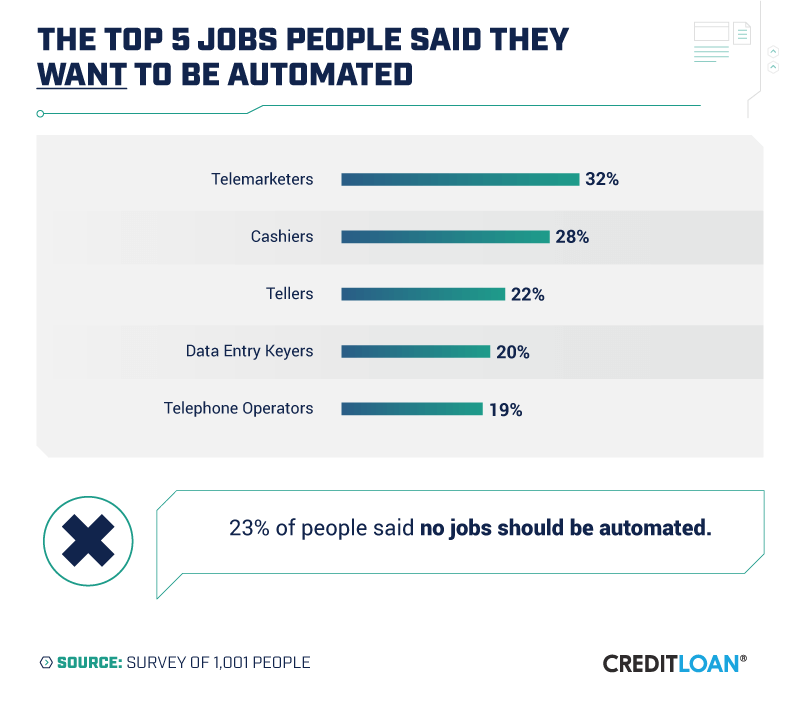 Twenty-eight percent said they’d want automated cashiers, despite the fact that it’s one of America’s most common jobs. Administrative roles were also deemed ready for robots by many Americans, including data entry keyers and payroll clerks. Even tax preparers were assessed as replaceable by 18 percent of participants – a trend already sending shockwaves through the accounting industry. Rock quarry splitter was the only manual labor position among the top 10 professions our respondents most wanted automated – and perhaps there’s a good reason for this finding. Some experts theorize human labor will actually become a mark of craft and luxury in the years to come. We appreciate a human touch in many goods and services: From handcrafted furniture to artisan liquors, a lack of automation can bestow a sense of quality. The results of our analysis are both frightening and enthralling: Millions may lose their jobs in the next decade, but what they’ll do with their collective potential remains unclear. Despite doomsday proclamations of an impending “ jobpocalypse ,” the nature of the automation transformation is still taking shape. If we assume the worst possible outcomes, we may miss chances to help American workers to find new applications for their talents. Automation may be inevitable, but despair is not. With hours and hours of human ingenuity soon to be at our disposal, there may be more reason for hope than we realize. If you’re ready to prepare for the automation revolution, we’re here to help. But investing in your own potential often requires capital – and not just of the human kind. From student loans to mortgages, Credit Loan is your guide for securing a better future, regardless if it includes robots. 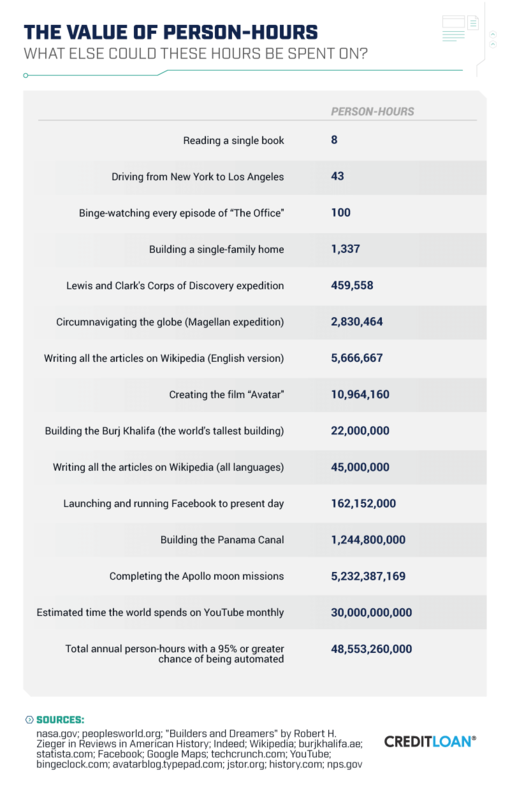 While third-party sources were available for some human accomplishments, others required us to calculate our own time estimates. From NASA, we know the Apollo missions employed 400,000 people at their peak (according to NASA Langley Research Center Contributions to the Apollo Program). We also have budget figures for each year of the Apollo program (Apollo Program Budget Appropriations). The assumption we make is that the peak year was the highest regarding employment and budget. Then, using the year with the highest budget (1966) as our 100% employment marker, we can guess employment scaled with the budget over time,allowing us to guess how many people were employed each year. From there, we multiply the people working by 2000 (40 hours * 52 weeks – 2 weeks vacation) to get the total man hours. Similar calculations were used to determine the man hours. required to build the Panama Canal, complete Lewis and Clark’s Corps of Discovery expedition, and finish Magellan’s circumnavigation of the globe. For the survey portion of the project, we collected data by surveying working Americans on Amazon’s Mechanical Turk. For the portion of the project that presents survey data, we collected 1,231 responses, 230 of which were discarded due to disqualification or incomplete data. 52.2% of the participants analyzed were working in occupations not found on the 95% or higher risk of automation list, and the remaining 47.8% were working in occupations on the list. Participants ranged in age from 18 to 74, with a mean of 36.8 and a standard deviation of 10.4. Participants were disqualified if they were not employed full time. The data have not been weighted, and no statistical testing was performed, so the claims listed above are based on means alone. As such, this content is purely exploratory, and future research should approach this topic more rigorously. Feel free to use our findings and graphics for your own noncommercial purposes. When you do, we hope you’ll link back to this page to attribute us appropriately. After all, we’re not robots: We like a little creditfor our work.